A flock of chickens can be a wonderful addition to your life. Chickens are intelligent and curious, and each has a distinct personality. They’ll keep your garden free of pests (and well fertilized) and bring a smile to your face every day! The average lifespan of a chicken ranges broadly depending on their genetics and life history. Heritage or “fancy” breeds can live 10-20 years. 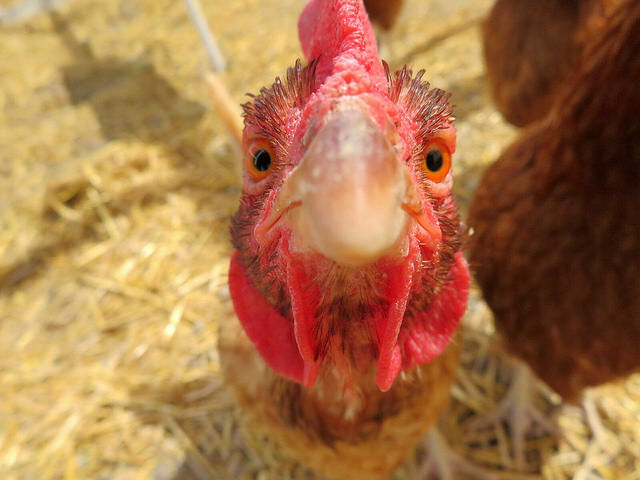 Chickens rescued from commercial farming industries typically have shorter life expectancies. Those bred for egg production can live anywhere from two to eight years, while chickens bred for meat only live one to five years. 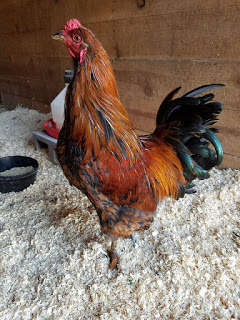 Weight also varies depending on breed, with layer hens weighing between three and five pounds, heritage breeds ranging from three to ten pounds, and meat-breeds weighing between eight and 20 pounds! Chickens are social creatures and need a flock to thrive. Like many social species, chickens naturally establish a hierarchy or “pecking order” with stronger, more dominant birds at the top, and weaker, more submissive birds at the bottom. The pecking order determines each individual’s role and status within the flock, and influences access to resources – higher ranking birds have first pick of food, mates, nest boxes, and roosting position, while lower ranking birds make due with what’s left over. Once a pecking order is established, it can remain fairly stable over long periods of time, though dynamics will shift depending on age and relative health, or the addition or removal of an individual. Apart from the occasional minor dispute, a flock with a well-established hierarchy is a peaceful one. Allow your chickens to work out their pecking order on their own; usually, they are able to do so quickly and without too much fuss. You may see birds pecking or chasing each other, or using other forms of communication including various body language (e.g. flared or fluffed feathers, wing flapping, a distinctive “dance”) or loud crowing (in the case of roosters) to establish dominance. It’s best not to intervene in the ranking process unless one bird won’t back down after a few minutes, or there is bloodshed. Roosters (mature male chickens; females are called hens) are the leaders and protectors of the flock. They alert others to sources of food or potential danger, and will attack any perceived threat to their flock. In many cases, multiple roosters can coexist peacefully once they have established their social ranking. Because of their (loud!) crowing, roosters are not welcome in all neighborhoods – be sure to check your local ordinances! Chickens have an innate homing instinct; if you provide a safe space for them to lay eggs, sleep, and avoid predators and inclement weather, they will happily return to their coop each evening before sunset. Most sources recommend at least four square feet of coop and run space per bird. This may be plenty if your chickens will be free-ranging during the day (i.e. have access to a garden or other open space to roam), but if they will be confined to a coop and run, you should provide a minimum of 10 square feet of space per bird. That being said, the more space your chickens have, the happier they’ll be! One 12”x12” nesting box per four hens, and approximately 10” of roosting space per bird is adequate. Chicken coops can be purchased pre-made, constructed from kits, or custom built. No matter which way you go, there are several things to take into consideration. Your chicken coop and run should be absolutely safe from predators. If housed improperly, chickens can be easy prey for raccoons, coyotes, predatory birds, and your household cats and dogs! Closures on doors and windows should be predator proof, and wire mesh should extend 12” down and 12” out from the bottom of the run to exclude burrowing predators. Coops should be relatively draft-free, but have proper ventilation to help maintain respiratory health. When choosing, designing, or building your coop, make sure it’s easily accessible for cleaning – a clean coop means happy, healthy chickens! Commercial chicken diets are readily available at your local feed store. We recommend formulas that are free of antibiotics and hormones (i.e. non-medicated). Many breeds of chickens can be free fed, but some heritage breeds and those bred for meat are prone to overeating and weight-related health issues so should be kept on a restricted diet. Laying hens require a diet with 16% protein and 3.25-4.25% calcium. Hard-boiling your hens’ eggs, crushing them with the shell, and feeding them back will help maintain your chickens’ protein and calcium levels. Male chickens and non-laying hens require diets with 14-16% protein and less calcium than layers. Starter and grower formulas provide chicks and young birds (<20 weeks old) with higher levels of protein to support proper growth and development. Because they have no teeth, chickens also require access to grit, which helps them break down and properly digest food. Grit can be purchased at your local feed store, or if your chickens are free-range, they’ll pick up smalls stones and pieces of gravel to do the job! Clean, fresh water should always be accessible. Make sure you have enough feed and water stations that all chickens in the flock (especially those lower in the pecking order) have access. 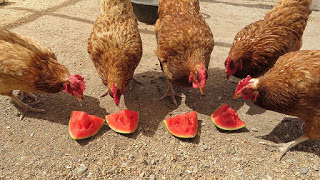 You can also supplement your chickens’ diets with a variety of leftovers from your kitchen. Most produce is fine in moderation, but if you’re unsure, do some research before you feed! 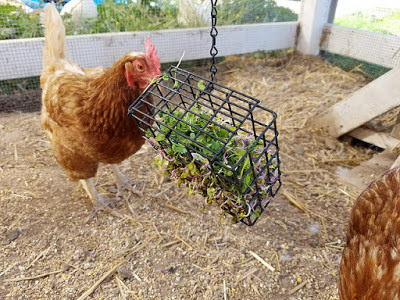 Below are lists of some herbs that will benefit your chickens, and some items to avoid. Avian health problems can be difficult to diagnose and treat, so it’s important to find a chicken-savvy veterinarian to help determine the best course of action. Below are a few things to watch for in your flock. Walking on hard, rough, or splintery surfaces can result in small wounds on the bottoms of your chickens’ feet. These wounds may become infected and form pus-filled abscesses. Consult your local avian vet for treatment, which often includes reopening the wound or removing the scab in order to drain the abscess. Once the site is clean, a topical antibiotic can be applied, and the foot wrapped to keep it clean and dry while the wound heals. Part of a chicken’s digestive system is known as the crop. This is where food is stored during the initial stages of digestion. Crop stasis (also crop impaction or sour crop) occurs when the crop is blocked or otherwise not functioning properly. Watch your chickens’ chests – a crop in stasis will be distended and may feel hard or full of liquid, like a water balloon. If the crop is not emptying, your chicken is not receiving nutrition, and needs to be seen by a vet as soon as possible to both remove the obstruction and determine its cause; the cause can be as dangerous as the obstruction itself. In warm weather, chickens are prone to heat stress. The best way to prevent heat stress is to provide your chickens with plenty of cool, shaded areas to rest; fans and misters can also help. Make sure they have access to clean, fresh water, and that the coop has good ventilation. Signs of heat stress include open-mouth breathing, drooping combs or heads, and collapse. If you notice any of these, work quickly but handle your chicken gently to avoid further stress. Move the bird to a shaded area and direct a fan toward it on a low setting. Mist the chicken lightly with cool water, focusing on the comb, wattles, legs, and under the wings; do not dunk your bird or pour cold water on it, as this could send it into shock. Continue to monitor your chicken until its behavior returns to normal. Consult your vet; depending on severity, your chicken may require antibiotics to help them recover from heat stress. 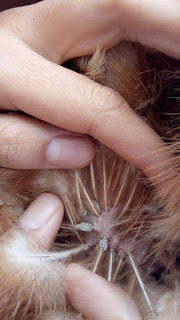 Check your chickens regularly for lice and mites. Lice can be difficult to see, but you may observe clusters of lice eggs at the base of your chicken’s feathers, particularly those near the vent. You can help prevent lice infestations by making sure your chickens have access to clean, dry areas in which to dust bathe. Adding some diatomaceous earth to the dust bath will improve its efficacy. Lice infestations can also be treated topically with medicated liquids or powders; consult your avian vet for the best course of treatment. Mite infestations are treated similarly, but can be much harder to eradicate, as mites are able to live for weeks without a host. Therefore, mite infestations require that your chicken’s living area be treated as well. Chickens naturally molt their feathers at least once a year, and sometimes more frequently. During this time, your chickens could lose a lot of their feathers and might look pretty raggedy. Molting typically takes one to three months, and is an energetically costly process, so it’s not uncommon for birds to act sick or otherwise “off”. Feel free to provide your molting chickens with a few extra treats to help them along, and call a vet if you’re concerned.